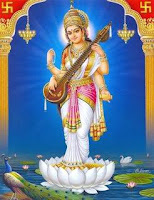 Saraswati is the Goddess of knowledge, music and the arts. She is considered as consort of Brahma, the God of creation. Thus, with the goddesses Lakshmi and Parvati, she forms the Tridevi ("three goddesses"), who are consorts of the male trinity of Brahma, Vishnu and Shiva, respectively. Saraswati's children are the Vedas, which are the oldest sacred texts of Hinduism.